Once the footings were poured, the foundation walls were built to a level grade. 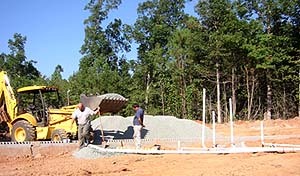 A soil compaction test required gravel to fill in the foundation. Soil was removed and 150 tons of gravel replaced it. 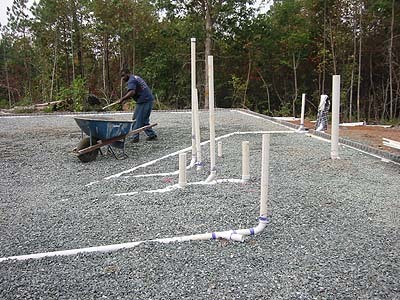 This will provide a sturdier foundation as well as some added thermal mass for the radiant floor heat. Here you can see Ron Williams ensuring the drain lines are properly supported with the compact stone to ensure once concrete is poured the drain lines will not move or fracture during the pour. 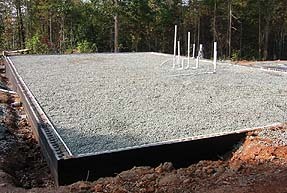 Finished foundation ready for radiant floor pipe installation.